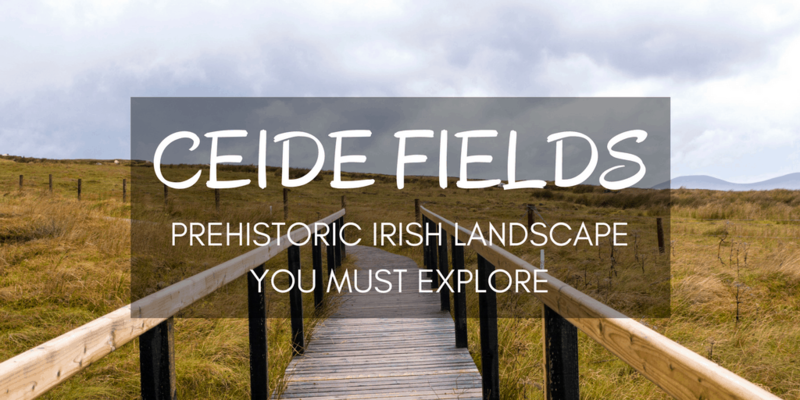 Ceide Fields is the most extensive prehistoric monument in the world. 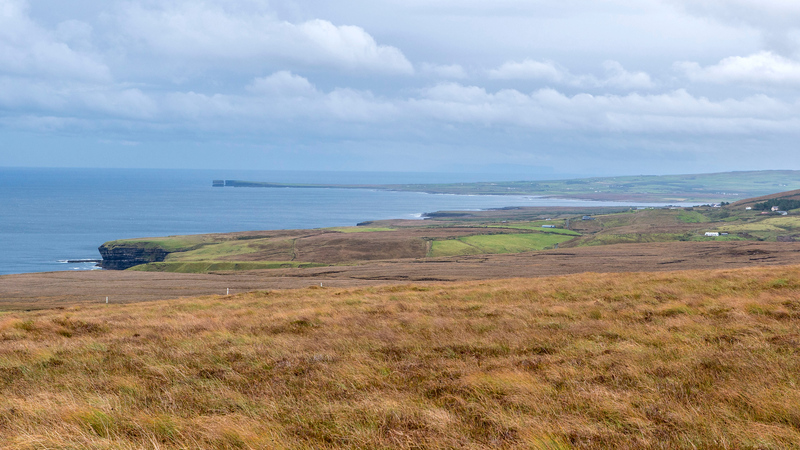 The landscape simply looks like a vast expanse of Irish bogland, as far as the eye can see. However, it’s one of the most unique settings in the world. Yet, at first glance, you’d never know it. 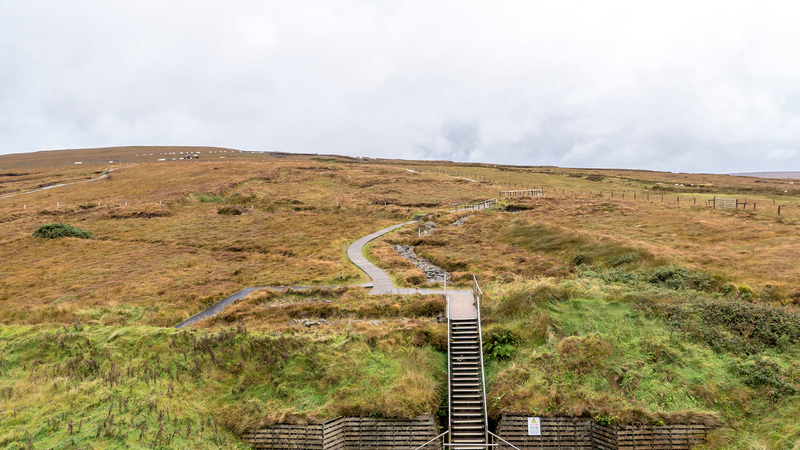 Céide Fields (céide means “a flat topped hill”) in North Mayo contains the oldest field systems in the world. It’s also the world’s largest dated Stone Age monument. Not only is this site the oldest known enclosed landscape, but it also demonstrates a changing climate and environment over several thousand years. 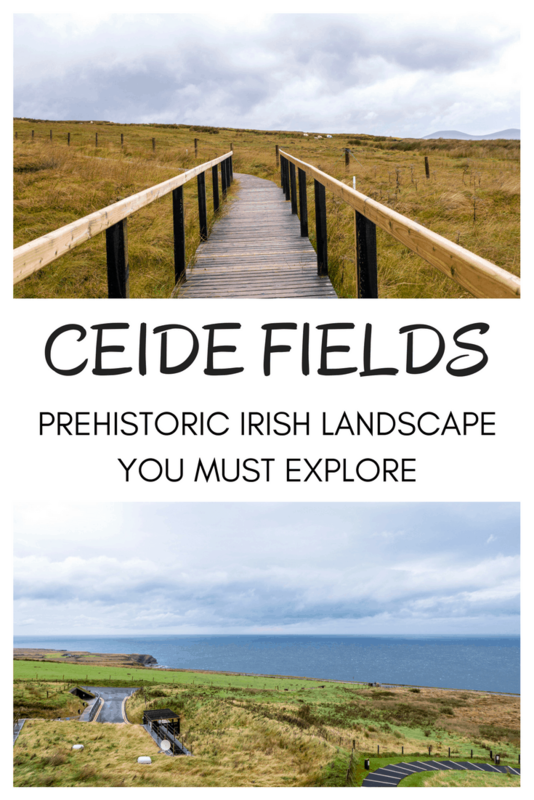 Currently, Ceide Fields is under consideration to become a UNESCO World Heritage Site because it provides an innate understanding of our past, showing how a Neolithic farming community lived and survived 5,000-6,000 years ago. Have you visited a place that wasn’t as it appeared on the surface? 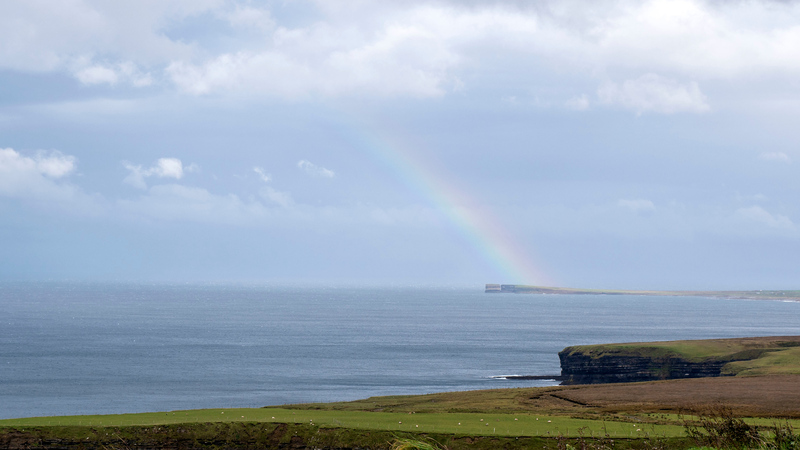 You’ll drive along the coast of County Mayo for some time before you reach Ceide Fields. The scenery alternates between dense bog and farmers’ fields. At last, you’ll reach the visitor’s centre where you’ll be able to learn more about this intriguing site. Thankfully, there is a lot of information in the visitor’s centre, through illustrations, displays, and video. If you simply looked at the land itself, you wouldn’t understand why it was so important. 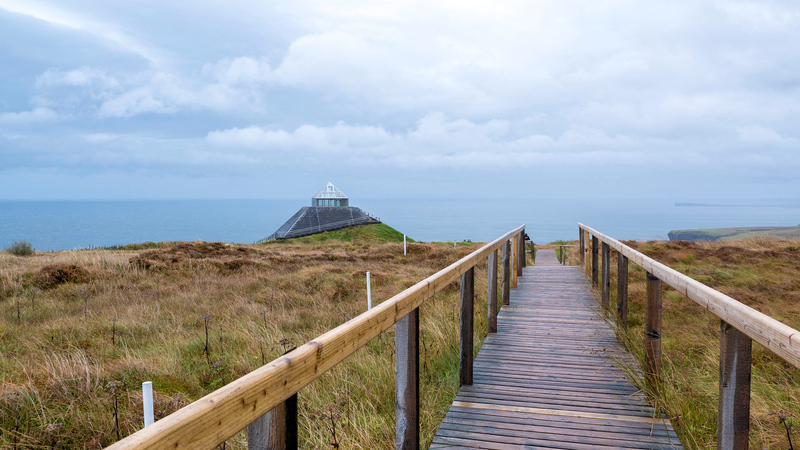 With that said, my favourite part of visiting Ceide Fields was strolling around the fields themselves via an extensive boardwalk across the property. 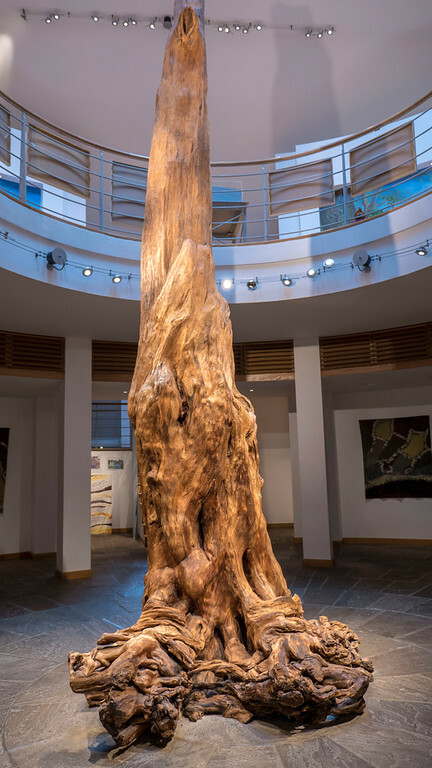 Would you believe that the remnants of this pine tree are over 4,300 years old? It’s a centre piece in the middle of the visitor’s centre, spanning two stories. This pine tree was found at Ceide Fields, preserved in the bogland. 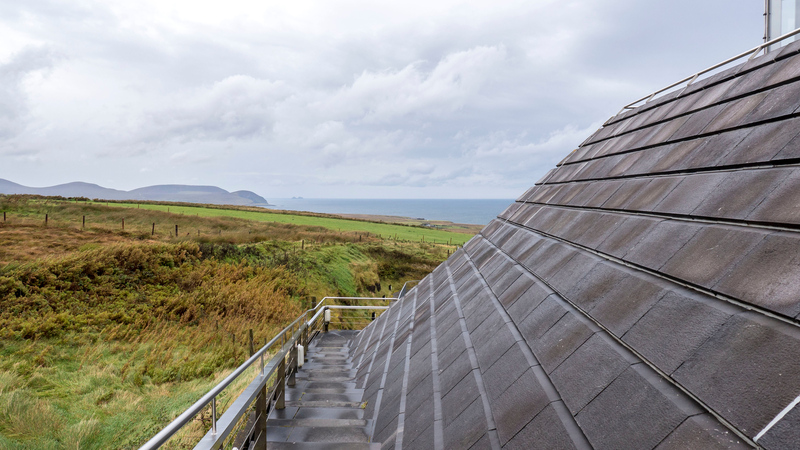 A local man, Patrick Caulfield, discovered Ceide Fields in the 1930s. As he worked on the land and cut away peat for fuel, Patrick noticed piles of rocks positioned in such a way that only humans could have arranged them. The rocks were beneath the bog, insinuating that they were placed in ancient times. Forty years passed. Patrick’s son, Seamas, studied archaeology and began to investigate the site more thoroughly. These excavations revealed a highly organized farming system, with fields, houses, and even tombs. A peaceful community once lived on this land. They worked together to clear a dense forest to farm their cattle. These communities divided 1,000 hectares of land between themselves and co-existed peacefully from 5,700 to 5,200 years ago. Nearly 6000 years ago, the climate here was much warmer and drier. The land was covered in trees: forests of pine, birch, hazel, oak, and willow. The prehistoric farmers cleared out most of the forest to develop their field systems. After five centuries, the climate became cooler and damper. 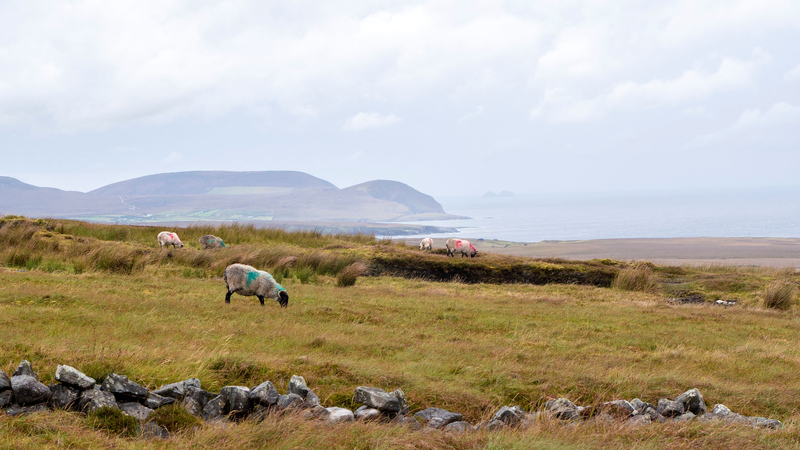 This lead to a widespread increase of blanket bog throughout their fields, making their farms unsustainable. The people abandoned their sites, and they slowly crumbled and became hidden beneath the growing bog vegetation. The pine trees grew back, but were slowly consumed by the bog, preserved in the peat. With the increase in dampness (a growth of bog requires at least 225 days of rain per year), the landscape grew to appear as it does today. 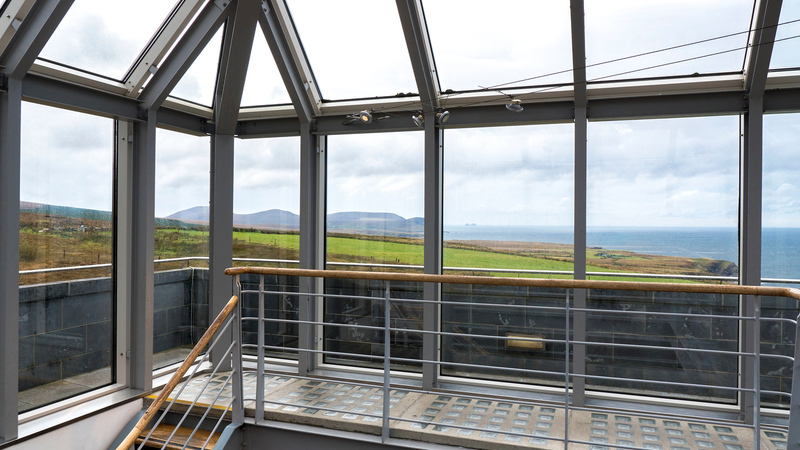 By checking out the visitor centre, you’ll learn even more about this historic marvel in much more detail. I highly recommend it! 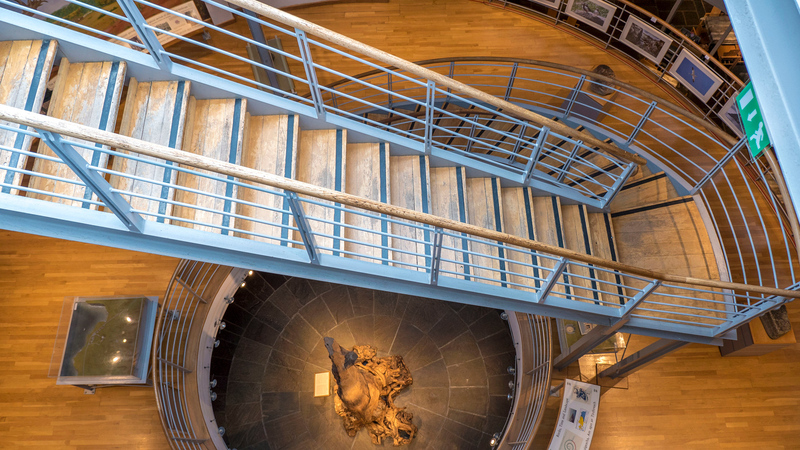 After you walk through the visitor centre, walk up a spiral staircase to the top of the building. From there, you can walk out onto a balcony near the roof. Be careful – it’s super windy up there. I am not sure I’ve encountered anywhere quite this windy before. I had to hang on to the railing as I was scared that I’d blow away! 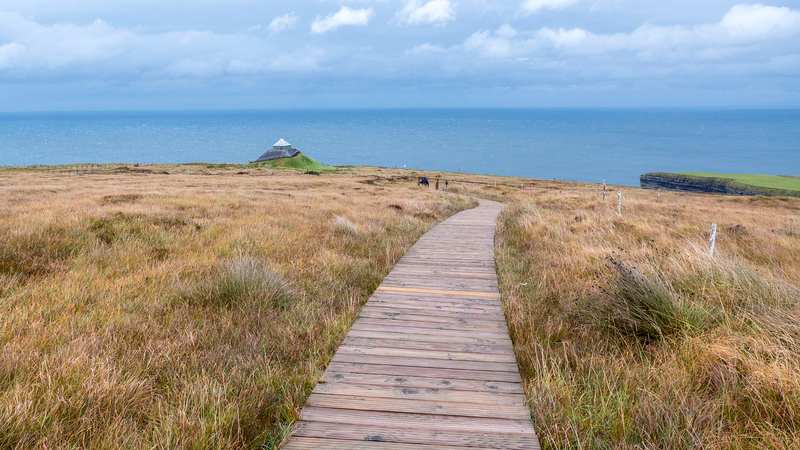 Walk down to the boardwalk where you’ll begin your scenic stroll around the bog. 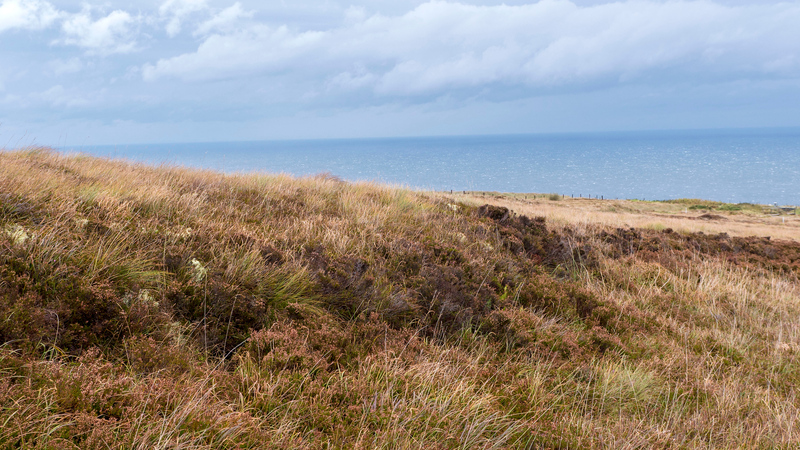 While some of Ceide Fields has been fully excavated, other places are mostly buried beneath the bog. At the beginning of the boardwalk, you’ll see one side of an exposed rock wall. These stones have not been moved in over fifty centuries! On the other side, you’ll see white stakes. The white stakes mark where the wall lies beneath as it has not been excavated. 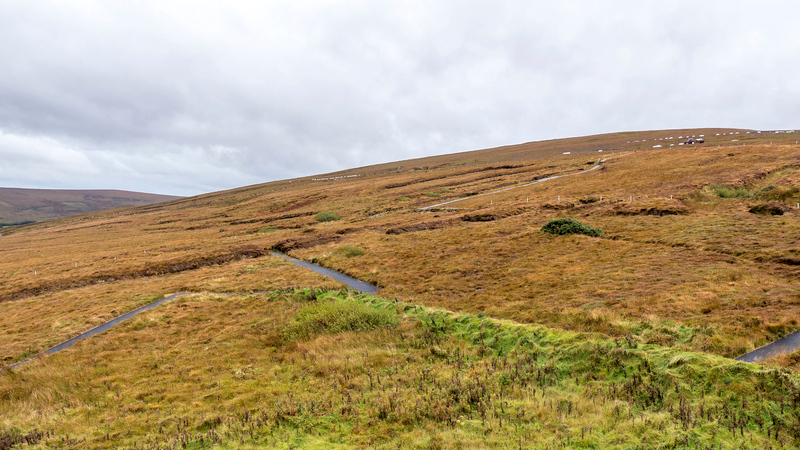 During an early archaeological excavation, Seamas used a technique of probing the bogs with metal rods to find the stone walls, hidden beneath 4.5 metres of bog. A jaunt around the full boardwalk takes approximately 20 minutes, and it loops back to the front of the visitor centre. It’s such a peaceful walk, as it’s so quiet and serene out there. When we visited, it was mostly just us and the sheep. Be sure to bring a rain jacket. 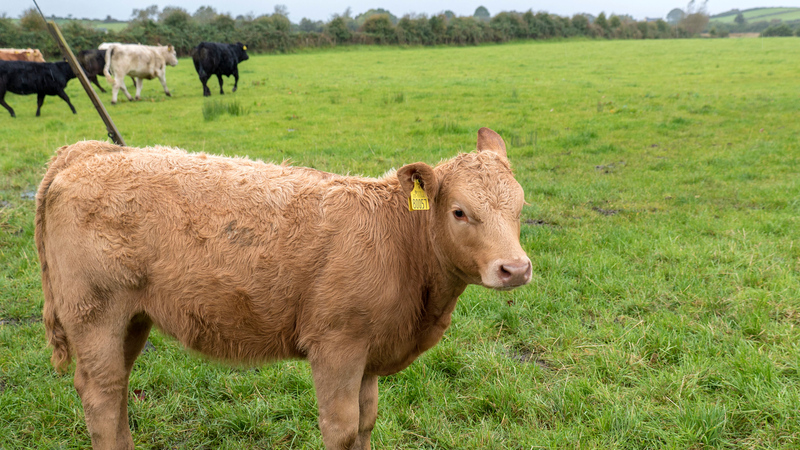 Naturally, it could start to rain or mist – it is Ireland, after all! 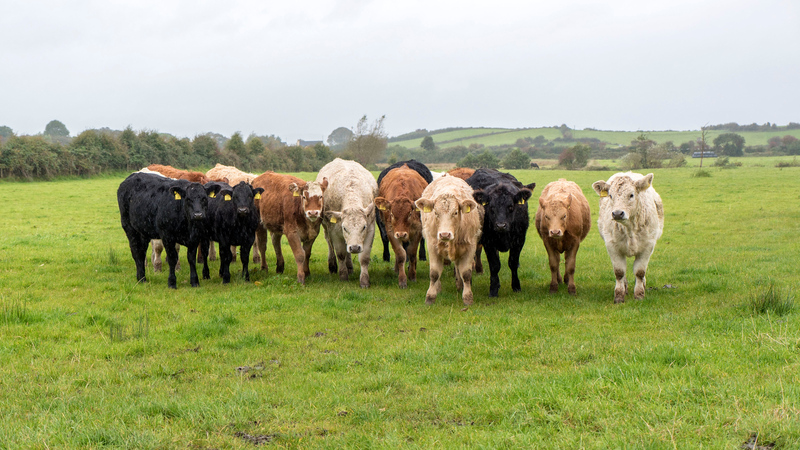 On the way to Galway, we saw these adorable cows and couldn’t resist snapping a few photos. I wonder if they resemble the ones that lived at farms owned by our prehistoric ancestors, 5000 to 6000 years ago? If you’re looking for a nearby place to stay, I recommend checking out Solis Lough Eske Castle in Donegal (check out more reviews or book your stay). Or, in Galway, I stayed at a comfortable, cozy, and affordable accommodation, The Connacht Hotel (check out these reviews or book your stay). Check out more photos of Ceide Fields at my travel photo album. You can also purchase photographs, canvas prints, cell phone cases, mugs, and all sorts of things made from any of my photos! PIN this image to your Pinterest board for future reference. Wow! Beautiful pictures and looks like a beautiful place to visit. Ireland is on my bucket list of places to visit, so thanks for sharing all of this great information. We got to explore so much or Ireland, but never made it to County Sligo. Now the more I. see and read about it, I am not really sure why.. That of course, means another trip is necessary. I really knew little to nothing about this historic area prior to your article, and I love visiting UNESCO sites. Perhaps it will be approved before we return. Thank you for sharing. Glad you got to visit the Ceide Fields. County Mayo is beautiful. Seamus Caulfield was my (Fiona’s) professor of archaeology at U.C.D. back in the early 90’s. I even got to spend a little time at the Ceide Fields. It was a lot of fun studying archaeology, though not an easy field (no pun intended) to get into. Indiana Jones has a lot to answer for!